Social media uses mobile and web-based technologies to create highly interactive digital platforms through which individuals and communities share, co-create, discuss, and modify their interactions. It facilitates pervasive and profound means of communication organizations, communities, and individuals. For this purpose, "Web 2.0" is often used interchangeably with "Social Media" or "user-generated content." There is convincing evidence that SNSs are becoming popular among university students, specifically in connection with their studies. There are over 350 such SNSs in operation across the internet,  however, there is a paucity of data in the adult literature describing their usage for educational purposes by medical students. This meta-analysis aims to test the hypothesis that "medical students use SNSs for educational purposes." The results of the meta-analysis are then analyzed and conclusions are drawn to capture future recommendations. The databases Medline, Educational Resources Information Centre (ERIC), Cumulative Index of Nursing and Allied Health Literature (CINAHL), the Cochrane library, and Excerpta Medica Data Base (EMBASE) were searched for articles about the usage of SNSs by medical students and the extent of usage of SNSs for educational purpose. The search included the period from 1 January 2004 to 1 January 2014. Data was retrieved by connecting Medical Subject Heading (MeSH) terms ["social media" or "social network" or "social networking" or "medical education" or "medical students" or "Facebook" or "Twitter" or "Web 2.0"] in Endnote X5 Software Philadelphia, PA.
Studies included surveys or research-based projects. Grade 5; Results are unequivocal. The meta-analysis was conducted through Forest plot that graphically represents the consistency and reliability of the results from selected studies. In this study, Forest plot was designed through Microsoft Excel 2013 by following the recommended steps by Neyeloff, Fuchs. Effect size of each study was computed as an outcome, and pooled effect size was also calculated to observe the heterogeneity among studies. This search retrieved 1188 citations. Analysis of these studies was done by following the guidelines of Preferred Reporting Items for Systematic Reviews and Meta-Analyses (PRISMA). 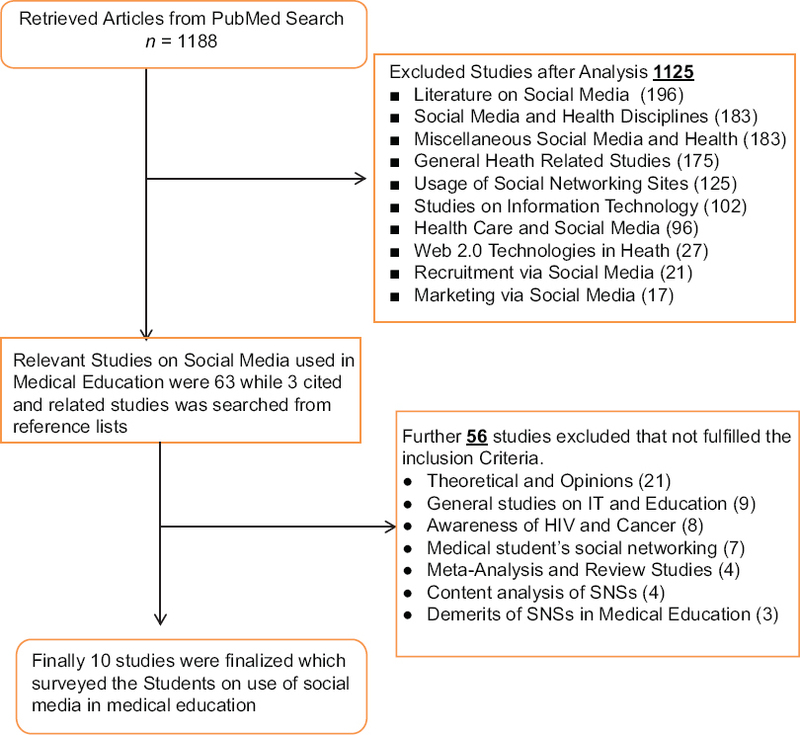 After analysis of abstracts and full-text articles, 1125 studies were excluded as they did not match the inclusion criteria either because these studies did not emphasize on social media literature or did not focus on SNSs usage in different health disciplines [Figure 1]. Sixty three studies were found relevant as they examined the usage of SNSs in medical education. During full-text analysis of these 63 studies, 3 more relevant studies were retrieved from cited research. From the aggregate of 66 studies, 56 were excluded due to theoretical and opinion-based contents, general studies on information technology and education, and meta-analysis, and review studies. The finally selected 10 articles were analyzed in detail. Overall, 75% (70-80%) of the respondents in this meta-analysis used SNSs, whereas 20% (1.7-54%) reported that they used SNSs for academic and educational purposes. No single study has performed the scientific analysis to examine the educational impact of the SNSs on the medical and allied health sciences students. Only two studies have applied inferential statistics whereas rest of the studies have presented descriptive statistics only. [Figure 2] shows the Forest plot that illustrates a series of estimates and their confidence intervals at 95% level. Each individual study's effect size (outcome) is shown by a square box and the confidence interval is represented through a horizontal line. This plot shows that the selected studies have wider confidence intervals with inconsistent response rates, indicating heterogeneity. On the basis of greater heterogeneity, random effects model is the appropriate effect summary model of this study. Therefore, effect summary 60.06% with confidence interval (49-71%) is the relative point to compare the effect sizes of all studies. The 10 studied articles are briefed in [Table 1]. Gray et al. explored the productive usage of SNSs (Facebook) by Australian medical students. They applied both quantitative and qualitative methods, and empirically, found that 25.5% of 759 respondents used Facebook for educational purposes. Sandars and Schroter  assessed the level of awareness and usage of Web 2.0 technologies (podcasts) by qualified medical practitioners and medical students in the UK. They found that respondents had greater understanding of different Web 2.0 technologies and they were eager to apply these technologies in medical education. Unfortunately, the respondents were unable to properly utilize them without training. The authors stressed the need to train the students in getting better results. White et al. investigated the usage of SNSs by medical students in Canada. The majority of respondents agreed that Facebook might be beneficial if its usage follows appropriate guidelines for maintaining privacy, legal, and social concerns. Roblyer et al. conducted a comparative overview of usage and purposes of SNSs by faculty and medical students in USA. The study concluded that only 9 (4.9%) respondents used Facebook and other social media for academic purposes and communication. Sixty (33%) of the respondents agreed that Facebook was for social and personal usage but "not for education." However, majority (69; 37.9%) of the respondents agreed that it would be very convenient to use Facebook for education. The students preferred SNSs technologies for study and class work projects whereas faculty still used traditional modes such as email. Mena et al. studied the eagerness of health professionals and medical students regarding the usage of SNSs for shaping their professional behavior in Spain. They found that 65.1% health professionals searched influenza vaccination queries on internet, and joined and actively participated in technical Facebook group. They claimed that students were more willing to join and participate in informal Facebook pages. Erfanian et al. explored the knowledge and usage of SNSs of medical students from different fields including Medicine, Nursing, Health, and Paraclinic in Iran. They found that 57.5% medical students were aware about SNSs. However, more than half (55%) used SNSs for getting in touch with their old friends whereas only 11% students used SNSs for educational purposes. They suggested that there was a need to improve the cultural and educational quality of SNSs for producing optimal outcome. Cain and Policastri  studied the informal application of SNSs among undergraduate pharmacy students in USA. They developed a unique learning environment to provide exposure to students regarding contemporary issues and perspectives of 3 external experts in their field by creating a Facebook group page with optional participation. The majority (84%) stated that their main reason of joining the group was to gain extra credit in exam. On the other hand, 16% highlighted various learning perspectives and priorities to join the group. Majority (64%) of the group members indicated this activity as somewhat valuable, 13% very valuable, whereas 23% remained neutral. This study concluded that group members' exam scores were significantly higher as compared to nongroup members. DiVall and Kirwin  studied the usefulness of SNSs for undergraduate pharmacy course-related discussion in USA via a Facebook page. Students actively participated in online discussion on Facebook as well as in survey with a response rate of 97%. The students contributed significantly in online discussion through posts and comments, with a contribution rate of 26%. Majority (86%) of the students found Facebook usage in their course extremely beneficial for learning perspectives. Fifty seven percent strongly recommended the continuity of Facebook application in upcoming courses due to its productivity and more learning opportunities. Hall et al. investigated the application and perspective of pharmacy students regarding SNSs in the UK. Among the respondents (377/659), 98% stated that they used SNSs for their personal matters, and few (1.7%) of them used SNSs for academic purposes. Seventy five percent agreed that they frequently used SNSs for discussing academic problems. The authors suggested that students require special training to familiarize them regarding how to effectively apply codes of conduct while using SNSs. Adithya et al. explored the usage of SNSs among students in India. The authors claimed that students most frequently used SNSs for information and getting in touch with friends. They found that 67 (54.92%) students suggested the usage of SNSs being beneficial to their studies and learning needs and 22% (18.03%) students stated that SNSs usage had a positive impact on their academic performance. Social networking is not without problems. Integrity and privacy are purported to be the two major concerns regarding the use of SNSs. The social communication paradigm is transforming the traditional face-to-face or telephone model to one that depends on a range of Web-based social media applications. These technologies have proliferated to the extent that can disrupt the delicate elements of our social fabric. Institutions need to stay abreast with the knowledge and understanding of the evolving landscape of legal and ethical issues about the unethical use of SNSs. Ethics, privacy, and code of conduct are important issues to be considered while advocating the legal applications of SNSs. In this meta-analysis, majority (70-80%) of the respondents used SNSs for social communications, however, 20% (1.7-54%) used SNSs for sharing academic and educational information. No single study has explored the impact of the SNSs on the academic performance of the students. Only two studies have applied inferential statistics whereas rest of the studies have presented descriptive statistics only. Authors have not reported the reliability and validity of their instruments, which might need to be considered in future studies. Social media are changing the face of medical field. The results of this meta-analysis emphasize the need to inculcate various modalities of SNSs in the teaching and learning strategies of the medical curricula. At the same time, students and faculty need to be more acquainted and well-trained to get the maximum benefits of SNSs. The upcoming studies might formulate the hypothesis "Do social networking sites promote medical education," and might test this hypothesis through regression and correlation analysis. The author deeply admires and appreciates the efforts by Mr. B. Bilal, PhD Scholar School of Management and Economics, Beijing Institute of Technology (BIT) China, for the organization of data and meta-analysis. Cartledge P, Miller M, Phillips B. The use of social-networking sites in medical education. Med Teach 2013;35:847-57. Alexa. The top 500 sites in the world. 2015. (Accessed October 23, 2016, at: http://www.alexa.com/topsites). Brenner J, Smith A. 72% of online adults are social networking site users. Washington, DC: Pew Internet & American Life Project; 2013. Lin MF, Hoffman ES, Borengasser C. Is Social Media Too Social for Class? A Case Study of Twitter Use. Tech Trends 2013;57:39-45. Greene JA, Choudhry NK, Kilabuk E, Shrank WH. Online social networking by patients with diabetes: A qualitative evaluation of communication with Facebook. J Gen Inter Med 2011;26:287-92. Kietzmann JH, Hermkens K, McCarthy IP, Silvestre BS. Social media? Get serious! Understanding the functional building blocks of social media. Bus Horiz 2011;54:241-51. Segerberg A, Bennett WL. Social media and the organization of collective action: Using Twitter to explore the ecologies of two climate change protests. Comm Rev 2011;14:197-215. Gray K, Annabell L, Kennedy G. Medical students′ use of Facebook to support learning: Insights from four case studies. Med Teach 2010;32:971-6. Farmer A, Holt CB, Cook M, Hearing S. Social networking sites: A novel portal for communication. Postgrad Med J 2009;85:455-9. Harden RM, Grant J, Buckley G, Hart IR. BEME Guide No. 1: Best evidence medical education. Med Teach 1999;21:553-62. Hammick M. Interprofessional education: Evidence from the past to guide the future. Med Teach 2000;22:461-7. Neyeloff JL, Fuchs SC, Moreira LB. Meta-analyses and Forest plots using a microsoft excel spreadsheet: Step-by-step guide focusing on descriptive data analysis. BMC Res No 2012;5:52. Moher D, Liberati A, Tetzlaff J, Altman DG. Preferred reporting items for systematic reviews and meta-analyses: The PRISMA statement. Ann Intern Med 2009;151:264-9. Sandars J, Schroter S. Web 2.0 technologies for undergraduate and postgraduate medical education: An online survey. Postgrad Med J 2007;83:759-62. White J, Kirwan P, Lai K, Walton J, Ross S. ′Have you seen what is on Facebook?′The use of social networking software by healthcare professions students. BMJ Open 2013;3. Roblyer M, McDaniel M, Webb M, Herman J, Witty JV. Findings on Facebook in higher education: A comparison of college faculty and student uses and perceptions of social networking sites. Inter High Edu 2010;13:134-40. Mena G, Llupià A, García-Basteiro AL, Aldea M, Sequera VG, Trilla A. The willingness of medical students to use facebook as a training channel for professional habits: The case of influenza vaccination. Cyber Beha Soc Net 2012;15:328-31. Erfanian M, Javadinia SA, Abedini M, Bijari B. Iranian Students and Social Networking Sites: Prevalence and Pattern of Usage. Pro-Soc Behav Sci 2013;83:44-6. Cain J, Policastri A. Using Facebook as an informal learning environment. Am J Pharm Educ 2011;75. DiVall MV, Kirwin JL. Using Facebook to facilitate course-related discussion between students and faculty members. Am J Pharm Educ 2012;76. Hall M, Hanna L-A, Huey G. Use and Views on Social Networking Sites of Pharmacy Students in the United Kingdom. Am J Pharm Educ 2013;77. Adithya KH, Ali K, Mahadevamurthy M. Use of Social Media among Dental Students of Farooqia Dental College, Mysore: A Study. International Conference on Open Access - Scholarly Communication Reincarnated: A Futuristic Approach: Bangalore University; 2013. Bennett GG, Glasgow RE. The delivery of public health interventions via the Internet: Actualizing their potential. Annu Rev Public Health 2009;30:273-92. Gold J, Pedrana AE, Stoove MA, Chang S, Howard S, Asselin J, et al. Developing health promotion interventions on social networking sites: Recommendations from The FaceSpace Project. Med Inter Res 2012;14:e30. Popoiu MC, Grosseck G, Holotescu C. What do we know about the use of social media in medical education? Pro-Soc Behav Sci 2012;46:2262-6. Guraya SS, Guraya SY, Habib FA, Khoshhal KI. Learning styles of medical students at Taibah University: Trends and implications. Res Med Sci 2014;19:1155. Guraya SY. Workplace-based assessment; applications and educational impact. Mala J Med Sci 2015;22:5-10. George DR, Dellasega C. Use of social media in graduate-level medical humanities education: Two pilot studies from Penn State College of Medicine. Med Teach 2011;33:e429-e34. Wiberg M. Netlearning and learning through networks. Edu Tech Soc 2007;10:49-61. Dron J, Anderson T, editors. Collectives, networks and groups in social software for e-Learning. World Conference on E-Learning in Corporate, Government, Healthcare, and Higher Education; 2007. Selwyn N. Looking beyond learning: Notes towards the critical study of educational technology. J Com Assis Lea 2010;26:65-73. King S, Greidanus E, Carbonaro M, Drummond J, Patterson S. Merging social networking environments and formal learning environments to support and facilitate interprofessional instruction. Med Edu On 2009;14. Kind T, Genrich G, Sodhi A, Chretien KC. Social media policies at US medical schools. Med Edu On 2010;15. Benetoli A, Chen TF, Aslani P. The use of social media in pharmacy practice and education. Res Soc Admin Phar 2014;11:1-46. Guraya SY, London N, Guraya SS. Ethics in medical research. Micro Ultra 2014;2:121-6. Paul JA, Baker HM, Cochran JD. Effect of online social networking on student academic performance. Comp Hum Behav 2012;28:2117-27. Kirschner PA, Karpinski AC. Facebook® and academic performance. Comp Hum Behav 2010;26:1237-45. Pasek J, Hargittai E. Facebook and academic performance: Reconciling a media sensation with data. Fir Mon 2009;14. O′Keeffe GS, Clarke-Pearson K. The impact of social media on children, adolescents, and families. Pediatrics 2011;127:800-4. Cain J, Fink JL. Legal and ethical issues regarding social media and pharmacy education. Am J Pharm Educ 2010;74:184. 1 Internet skills of medical faculty and students: is there a difference? 6 Social Media and Radiology Education: Are We #Ready?